A Set of Four Matching Royal Doulton Burslem Cups dating to c1902. I purchased four twin-handled Royal Doulton cups that date to Burslem between 1902 and 1922 according to the Doulton makers stamp on the bottom. However, I cannot find the pattern anywhere. 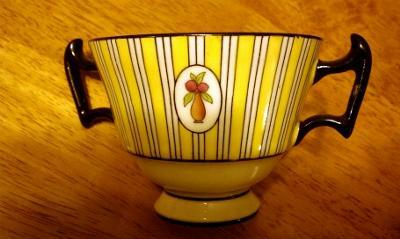 The cups are decorated in black, white and yellow stripes with a central panel featuring a vase with fruit on one side. Could anyone please tell me if they are worth much particularly as they are without the saucers and I do not know the name of the pattern? 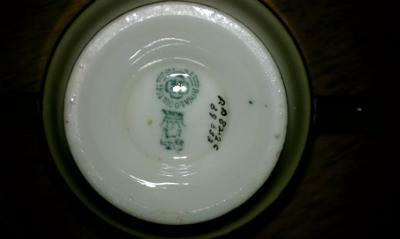 Hi Ann Marie, those are very nice cups and from what I can see of the Doulton marks they appear to have a Robert Allen design code in the RA 82– range, which would date them to around 1914. Collectable cups are always quite popular and there are always collectors looking to match odd pieces. However, they would certainly be more collectable as a set or better still as a trio. I would try to find matching saucers to your Doulton Burslem cups before selling them, or if you don’t want to do that, I would list them individually on ebay. Providing the condition is A1 they should fetch decent money.